See who won the 2019 Taste of Elegance Competition! 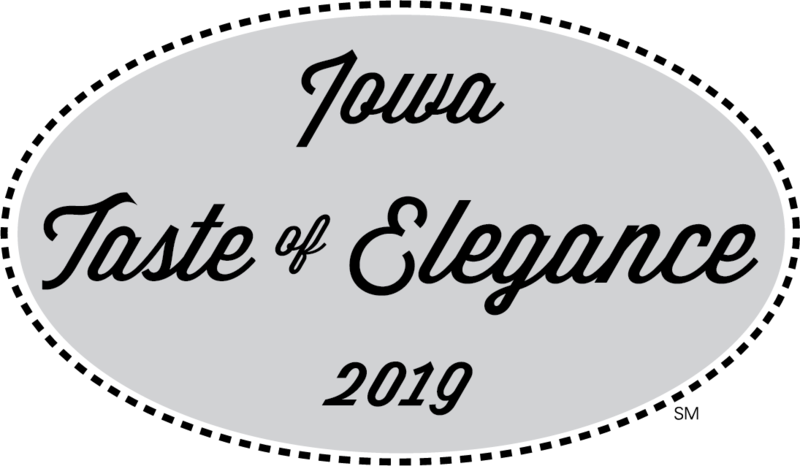 The Taste of Elegance is a competition hosted by the Iowa Pork Producers Association (IPPA) to celebrate pork and find Iowa’s best pork chef in fine dining. Pig farmers work hard to produce safe, wholesome and affordable pork for all consumers to enjoy and we know that chefs work equally hard to create superior entrées that keep their customers coming back. It takes both industries working together to better serve consumers and we want to celebrate with Iowa’s top chefs! The contest will be held on Jan. 21, 2019, at the Iowa Events Center in Downtown Des Moines, Iowa. Chefs may arrive any time between 12:00 Noon and 2:30 p.m. ALL chefs, regardless of judging time, must be checked in by 2:30 p.m. The Taste of Elegance competition is an individual chef event for professional chefs. Chefs may be sponsored by their restaurant or workplace establishment and promote it at the event, but they are competing as an individual. Signed Commitment Forms to compete are due December 15, 2018. Once a chef has won the title of Chef Par Excellence, they are ineligible to compete the following year in any Taste of Elegance competition. A different chef from the same restaurant/ establishment may compete. A chef may only compete in one Taste of Elegance competition per year. The competition will be limited to 12 chefs. NEW! 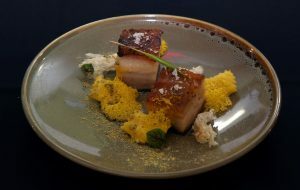 Each contestant will prepare an original main entrée utilizing the cut Fresh Pork Belly. Pork belly comes from a hog’s ‘belly’ or underside after the loin and spareribs have been removed. Fresh pork belly is succulent and richly flavorful and is often served in small portions. Pork belly is at its best and is most tender when prepared using a slow cooking method, such as braising. 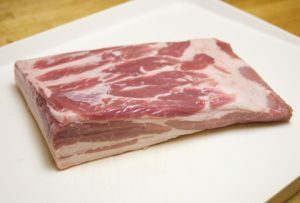 Pork belly also is a popular menu item among restaurant chefs who appreciate its versatility, flavor, and texture. The contest requires the use of this cut as the main ingredient in the entrée. At least 4 oz. should be used in the judging plate. Other pork cuts may be used in addition to compliment the dish. Each contestant is responsible for furnishing all recipe ingredients, cooking utensils and chafing dishes along with three plates for presentation to the judges and one plate for presentation at the reception that evening. Each competing chef will receive a $200 stipend to offset their pork costs after completing the competition. It is encouraged that the pork entrée submitted for competition also be featured on the chef’s menu in his/her establishment. It could be a limited time offer. We are looking for a consumer-friendly and menu worthy entrée. Registered contestants must submit recipes to the Iowa Pork Producers Association no later than Jan. 7, 2019. The recipe will not be published, but will be evaluated in the judging room. Recipes must be e-mailed in a Microsoft Word document so the format can be edited for the judging binders. Your recipe will not be altered. You must follow the recipe you submitted during the contest – no changes will be permitted after submission. Measurements are not necessary in your submission. Step-by-step preparation methods and all ingredients are required. A short biography also must be submitted by Jan. 7, 2019, for use in the reception program and post-promotion. Contestants will be utilizing the Iowa Events Center’s main kitchen to prepare their judging plates and samples. Judging will take place near the kitchen and the reception will take place in the Iowa Events Center conference space. Chefs will be assigned and responsible for hot holding cabinets to transport their samples to the reception area. Kitchen work spaces must be cleaned before leaving for the reception. Contestants will have access to a stove, oven, steamer, flat top grill, fryer and walk-in cooler. For kitchen questions, contact Ali Brackett with the Iowa Events Center at 515.564.8249 or Ali_Brackett@comcastspectacor.com. Contestants may have one helper in the kitchen and up to four helpers during the Tasting Reception. Contestants are required by the Iowa Events Center to wear appropriate chef attire including chef’s hats – ball caps are not allowed. The Iowa Events Center has specific rules for using colored cutting boards for raw versus cooked product. Contestants will follow these rules and sign a participation agreement with the Iowa Events Center before using their kitchen space. There will be a panel of three judges. The judging will approximately begin at 3 p.m. Contestants will be notified of their specific judging time prior to the contest. Contestants must have their plates ready at their designated time. If it is more than three minutes after the designated time, the chef may be disqualified. Chefs will need to prepare four (4) plates total – three for the judges and one for the People’s Choice Table Display. Chefs must furnish their own dinner plates. The judges will be evaluating the entrée only. Side dishes and garnishes should be complimentary to the entrée, but will not be judged. Judging will be done by blind tasting. Judges will be served by IPPA’s Restaurant & Foodservice committee members and will not have contact with contestants until all entrées have been judged. The reception will start at 6 p.m. and end by 8:30 p.m. Awards will be presented at approximately 7:30 p.m.
Each contestant will be furnished an 8’x 8’ booth, with two 6’x 2’ long tables to display promotional items for their restaurant and provide space for serving samples. Booths must be set up by 5:45 p.m. No audio or TV displays will be allowed at the reception. 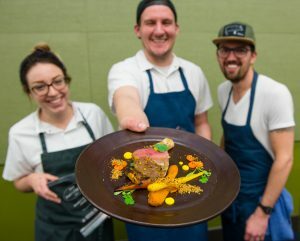 Each contestant must provide a presentation plate to show what their entrée would look like if ordered at their restaurant. All presentation plates will be placed on a display table for People’s Choice voting. Each chef that competes must provide bite size (1 oz.) samples of their entrée for at least 300 people and chafing dishes for serving. The Iowa Events Center can provide chafing dishes if requested one week prior to the competition. Small serving plates and forks will be provided at each chef’s reception station. If a chef does not provide samples, he/she will be disqualified from the competition. The People’s Choice Award will be voted on based on these samples. Iowa wineries and breweries are invited to showcase their Iowa products at our Tasting Reception where the competing chefs will be serving samples of their competition dishes. The reception is an invitation-only event. Our VIP guests include leaders and farmers in the pork industry, Iowa’s legislative representatives, food blogger partners, industry partners and some lucky pork-loving consumers. There are limited spots available and spots fill up quickly. Iowa Pork covers the pouring fees and offers free booth space to the first wineries and breweries who contact us. Please call or e-mail Kelsey Sutter at the Iowa Pork Producers Association with any questions at (800) 372-7675 or ksutter@iowapork.org.